We created this backyard oasis in collaboration with an electrician, a fencing contractor and a pool contractor. 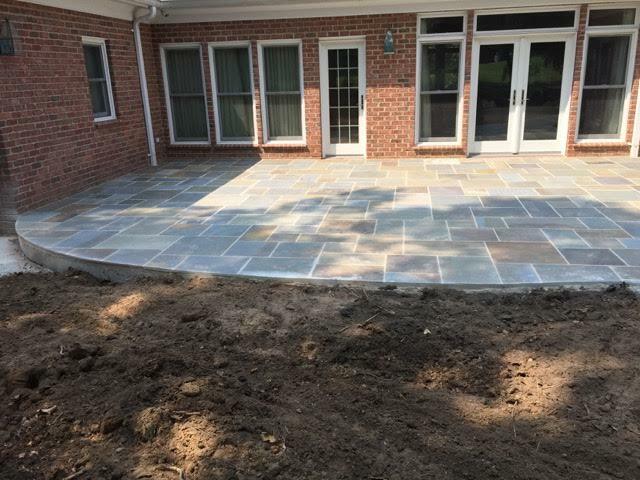 After moving in to what they hope will be their forever home, these homeowners asked us to completely transform their blank slate of a back yard. Now, their tranquil retreat includes a patio with a knee wall, a cascading water feature, a swimming pool, a fire pit, night lighting and many various plantings. We also installed significant drainage work that can’t be seen. If you or anyone you know is interested in transforming their backyard into an oasis, contact us today for a free consultation. 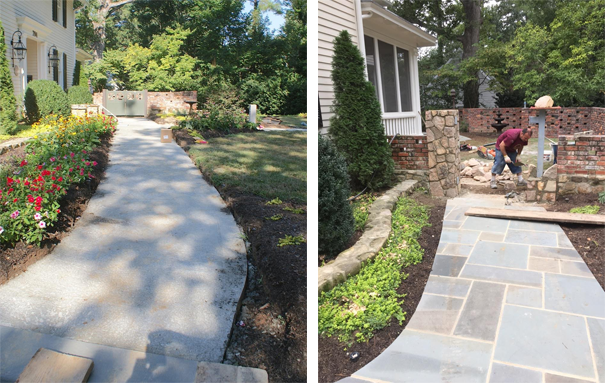 We just completed a project in a Chapel Hill front yard where we created a stone walkway and added columns to a garden wall. Before, the entrance was a standard sidewalk leading both to the home and an enclosed garden. The garden was surrounded by a brick wall with a large white gate serving as the garden’s entrance. The original design had a functional blue print, however, it lacked character and elegance. This client wanted a customized style with more polish than the previous one. Redoing steps whether at your front entry or in your backyard can make a big difference in the overall design of your home. Many clients come to Natural Designs to replace steps that are old and craking or in poor structural shape. Other clients simply want to improve the look of their home. Natural Designs provides complete services for new stone and masonry steps. We’ll come out to your property, discuss layout options and materials and provide an estimate. Below are a couple of examples of new steps we’ve recently put in for clients. Please call (919) 522-3886 or contact us to schedule an appointment. 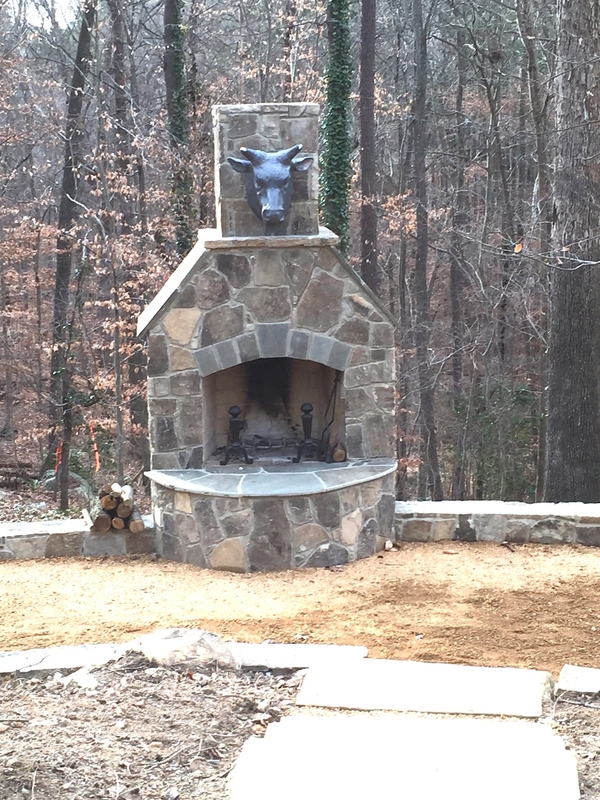 This was a challenging Cary Waterfall Installation project located at parkside commons in Cary/Morrisville. The difficult portion of this installation arose because the walls were built without any consideration for the water feature. The location and steepness of the site was also challenging, requiring heavy equipment (exactors) to locate each boulder. This was a risky and time consuming waterfall installation, but came out beautifully. Most of the people involved, including engineers and site managers, had a hard time visualizing how it could be done, but we assured them of the plan and everyone was extremely pleased with the end results.